CCTV security camera systems can be customized to fit or match a customer’s demands in security TDE Security Solutions offers customizable solutions in Singapore to cater to any needs.CCTV cameras should provide high quality pictures and videos at daytime, and also be capable of doing the same thing at night or in areas where there are low light conditions. With TDE Security in Singapore , we offer remote access viewing for CCTV. Just a click on an app, your CCTV video stream will be effortlessly displayed right before you from any parts of Singapore or the rest of the world . Thus giving you live update over your household and business. Unlike most CCTV service providers, TDE Security maintains our own CCTV technicians who are professionals in installing, maintaining security systems thus giving you a peace of mind when using our CCTV systems. HD CCTV security camera systems are able to product sharp and clear cut video footages. Able to be installed in many places around the premises, HD CCTV cameras in Singapore are one of the most effective security implantations. In addition to these features, the cameras provide dynamic high quality and sharp image reproduction (1280*720 resolution) for day, night time, as well as dimly lit areas. Added with the ability to be customized, they are able to cater to a number of customer specifications in fitting and style. To gain access to the security camera footage, one can use a mobile app and view the footage stream through just a few taps. This allows the operator to get access to live video feedback from the security cameras at anywhere and anytime along with regular updates in regards to areas covered. 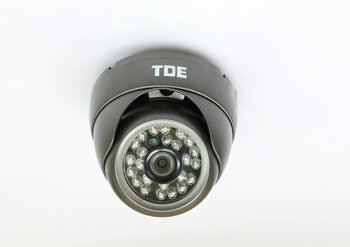 TDE Security provides a crew of highly skilled CCTV technicians to plan, install, and maintain the camera systems. Which is why, one can expect the best and most productive measures in security upon camera purchase and installation. Have a look at these HD CCTV security camera systems for more information about their specifications.